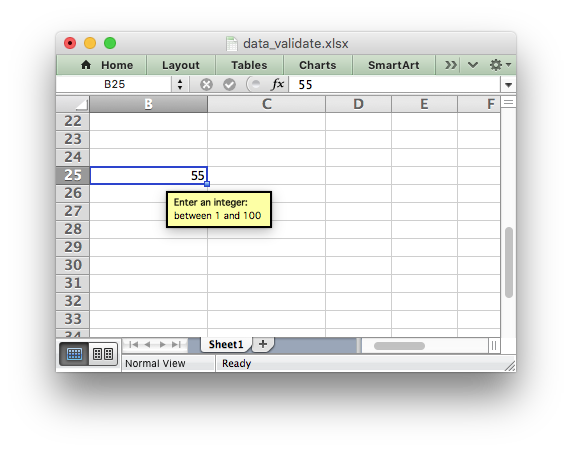 Data validation is a feature of Excel which allows you to restrict the data that a user enters in a cell and to display associated help and warning messages. It also allows you to restrict input to values in a dropdown list. For more information on data validation see the Microsoft support article “Description and examples of data validation in Excel”: http://support.microsoft.com/kb/211485. The following sections describe how to use the data_validation() method and its various options. 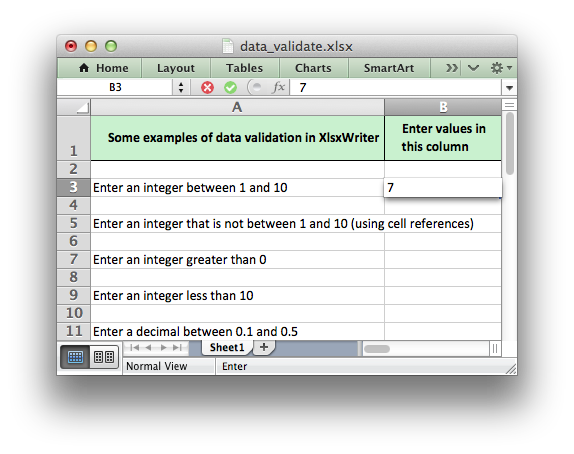 The data_validation() method is used to construct an Excel data validation. The data validation can be applied to a single cell or a range of cells. As usual you can use A1 or Row/Column notation, see Working with Cell Notation. integer: restricts the cell to integer values. Excel refers to this as ‘whole number’. decimal: restricts the cell to decimal values. list: restricts the cell to a set of user specified values. These can be passed in a Python list or as an Excel cell range. date: restricts the cell to date values specified as a datetime object as shown in Working with Dates and Time or a date formula. time: restricts the cell to time values specified as a datetime object as shown in Working with Dates and Time or a time formula. length: restricts the cell data based on an integer string length. Excel refers to this as ‘Text length’. custom: restricts the cell based on an external Excel formula that returns a TRUE/FALSE value. any: is used to specify that the type of data is unrestricted. It is mainly used for specifying cell input messages without a data validation. # Using 'source' with a string list. Note, when using the list validation with a list of strings, like in the last example above, Excel stores the strings internally as a Comma Separated Variable string. The total length for this string, including commas, cannot exceed the Excel limit of 255 characters. For longer sets of data you should use a range reference like the prior example above. The dropdown parameter is used to toggle on and off the ‘In-cell dropdown’ option in the Excel data validation dialog. When the option is on a dropdown list will be shown for list validations. It is on by default. The input_title parameter is used to set the title of the input message that is displayed when a cell is entered. It has no default value and is only displayed if the input message is displayed. See the input_message parameter below. The show_input parameter is used to toggle on and off the ‘Show input message when cell is selected’ option in the Excel data validation dialog. When the option is off an input message is not displayed even if it has been set using input_message. It is on by default. The error_title parameter is used to set the title of the error message that is displayed when the data validation criteria is not met. The default error title is ‘Microsoft Excel’. The maximum title length is 32 characters. 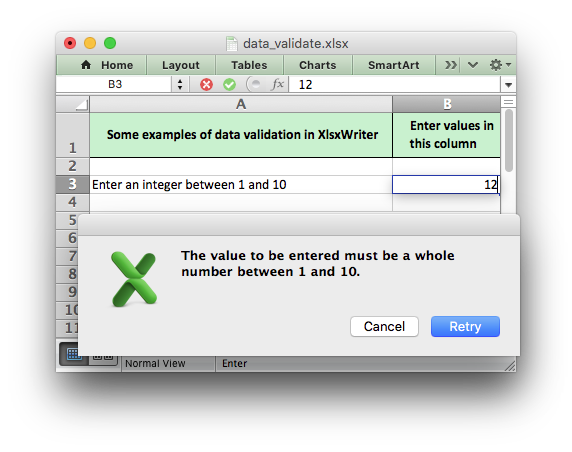 The show_error parameter is used to toggle on and off the ‘Show error alert after invalid data is entered’ option in the Excel data validation dialog. When the option is off an error message is not displayed even if it has been set using error_message. It is on by default. See also Example: Data Validation and Drop Down Lists.